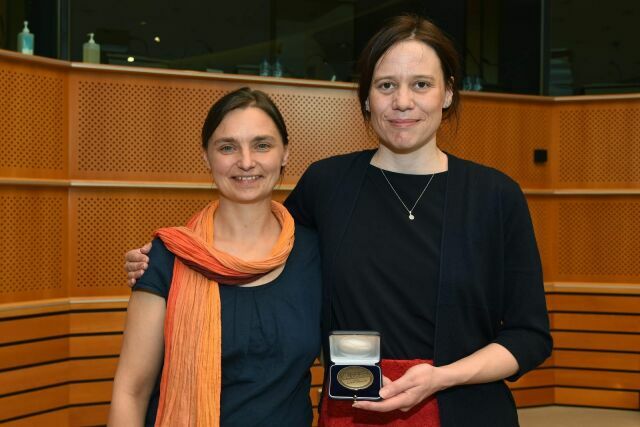 In a ceremony at the European Parliament on 31st May, the World Health Organization (WHO) recognized our longtime work for sustainable development and tobacco control with a World No Tobacco Day Award 2017. Every year on World No Tobacco Day, the WHO awards individuals, organisations and institutions for their outstanding accomplishments in the area of tobacco control. This year, the Irish Department of Health and the Australian lawyer Jonathan Liberman, among others, received the prize. We thank our colleagues of the Smokefree Partnership for the nomination. 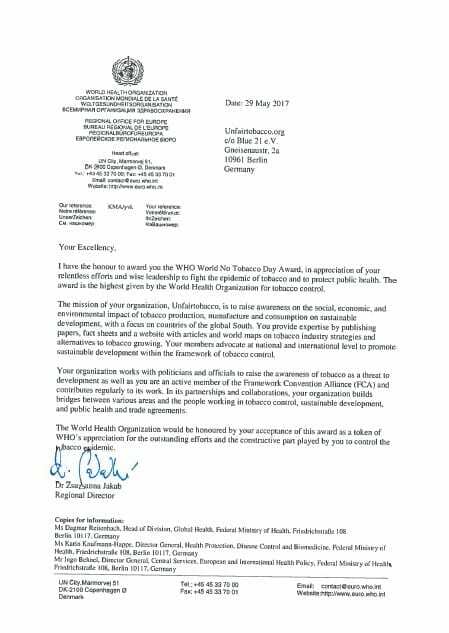 We feel very honoured by this WHO recognition of our longtime work for development and tobacco control. The beginning of our project was a public action: On World No Tobacco Day 2004 we “awarded” the German cigarette corporation Reemtsma Cigarettenfabriken GmbH with a negative prize for its contribution to deforestation in Tanzania where the company sourced tobacco leaf. Motivated by the public response to the subject, we developed the project Unfairtobacco. In the first years, we focused on development issues related to tobacco growing: Child labour in the fields, deforestation and exploitation of smallholder farmers. We worked to advance the development perspective in the tobacco control community and raised awareness in public events. In 2014, we broadened our focus areas. Since then, we analyse the tobacco value chain from field to cigarette butts. We show how tobacco growing, cigarette production and smoking negatively influence sustainable development. To raise awareness, we organize events, write papers as well as factsheets and work with students in school workshops. Additionally, we provide background information and world maps of tobacco industry strategies and alternatives to tobacco growing on our website. Together with partners from all over the world, we organize campaigns to expose the corporate misconduct of tobacco companies. This work could have never been done without support. We owe gratitude to our families and friends who always had our backs. For their good advice and administrative assistance, we thank our team at BLUE 21, the association that runs Unfairtobacco. Furthermore, we thank our international partners for the constructive collaboration that we very much appreciate. The award encourages us to continue our work for tobacco control on the journey to a sustainable world. We will tirelessly expose how tobacco industry harms farmers, consumers and the environment. "In its partnerships and collaborations, your organization builds bridges between various areas and the people working in tobacco control, sustainable development and public health and trade agreements. The World Health Organization would be honoured by your acceptance of this award as a token of WHO's appreciation for the outstanding efforts and the constructive part played by you to control the tobacco epidemic."